Cinnamon roll recipes have been around forever and a day, this I know but I have never made them. 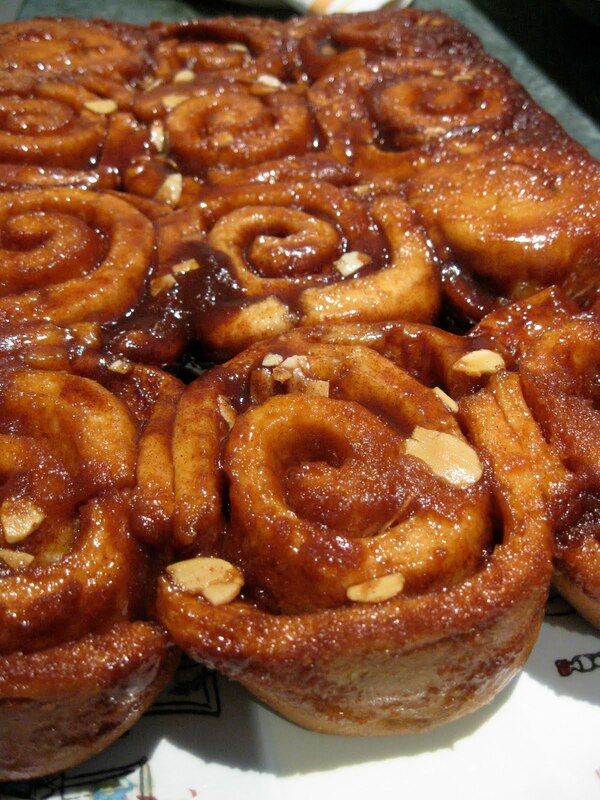 I almost did a few years back but then I went up to our friends parents house where we were introduced to Bonnie's blow your mind pecan rolls- I got intimidated and decided to put it on the back burner for a little while longer. Call me crazy but I really didn't have a lot of confidence when it came to yeast and dough. I'd have a go but my heart really wasn't in it and you could tell in the end result. It wasn't until my year in West Virginia where my beautiful neighbour, Wendy helped me connect with baked goods. She introduced me to her three day in the making bread (which we still make every week, something Nic has taken over due to my lack of presence at home these days) and she also taught me to love the process of bread making. After reading one of Armchairchef-bryan blogs on cinnamon buns a few weeks ago I decided it was time to get in there and have ago. His buns looked divine and his method sounded laid back and relaxed, so I thought if I don't do it now then I'll never do it. I changed a few measurements, so I've written it up hoping other Australians will give it a go in terms they are more comfortable with, like grams and celsius but for everyone else who wants a great cinnamon roll recipe click on over to Bryan's blog for his version, as you can see it is a winner! 1. In a mixing bowl add water, sugar and yeast, stir with a wooden spoon then leave to activate (approx. 6 minutes). 2. Once activated, add melted butter, salt and flours. Begin to kneed with a dough hook on low speed until well combined. Turnout onto floured surface and kneed for 2-3 minutes then spray your mixer bowl with cooking spray and place dough back inside, cover with glad wrap and leave to rise for 3--40 minutes. Once risen, knock down with your fist, recover then place in the fridge over night. 3. Before going to bed, pull out a block of butter so it is ready to go for the morning. 4. Remove dough from fridge then make your cinnamon butter by putting butter, sugar and cinnamon into a medium bowl and stirring to combine. Lightly flour your bench, turn out dough and roll into a rectangle shape (30 x 40 cm). 5. Once rolled spread dough with your cinnamon butter then roll into a long log. Once you have a log shape cut into 12 pieces, line a baking tray with baking paper (allowing paper to go up the sides as well) and place rolls onto baking tray. 6. Preheat your oven to 160c then cover rolls with glad wrap and leave to prove for 30 minutes. Once proven, place in oven and bake for 45 minutes. Remove from oven, flip rolls onto serving platter exposing awesome, sticky cinnamon side then eat! *For those of you who don't own a rolling pin, don't give up- I left mine at work so I used the empty wine bottle from last nights dinner and it worked a treat! Camilla you are so cool thanks for the shout-out! Your cinnamon rolls look absolutely beautiful! Ok, personal question... did you feel about 15 pounds heavier after you had them? I didn't eat for most of a day after I made these last time, (worth it by the way). God dam it Camilla I have just lost 10kg could you not cook something that is not going to put back the kg's!, they look so gooood! Yum!! We used to make those when I lived in the US a lot. Thanks for your lovely comment on my blog. My dream is to one day make money from something I love doing, but I'm not good enough for that yet. Bryan- so,sooo good but yes, I must have a run this week to keep the guilt at bay..
Lisa- These are such an American food, I totally agree, it made us pine a little.